After a busy day at the beach or at work, it's time to kick back and relax a while. What better way than to listen to some music. You can find performances almost any night of the week, all within a short driving distance. Area musicians as well as professional traveling groups are featured in these summertime performances. For the outdoor venues, grab your lawnchair or a blanket and get ready to be entertained. Outdoor performances are free; there may be a charge for an indoor venue performance. Local concerts by the Scottville Clown Band throughout the summer. Sundays on the Porch, 1:30-4:30pm, Douglas Valley Vineyards, Manistee (May26-September 29, 2019). Live Music on the Deck, 6-8pm, Golden Sands Golf & Bucket Bar, 2501 N. Wilson Road, Mears. Some Friday & Saturday shows. Concerts in the Park, 7pm, Village Park, Onekama (July 1-August 19, 2019). West Shore Civic Band, various locations, Ludington. Manistee Shoreline Showcase, 7pm, Rotary Gazebo, First Street Beach, Manistee (June 18-August 27, 2019). Pickin' in Pentwater, 7pm, Pentwater Village Green. 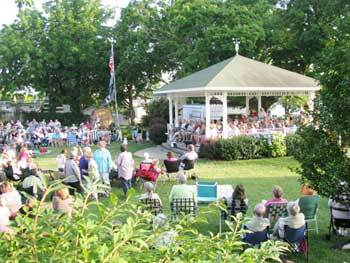 Summer Concert Series, Scottville Clown Band Shell. Silver Lake Concert Series, Golden Township Park at Silver Lake Sand Dunes, 7pm. Echoes through the Timbers, 7pm, Wenger Pavilion, Baldwin. Roots on the River, 7pm, Manistee Jaycees Riverwalk Bandshell, Memorial Drive, Manistee. Music on the Commons, 7pm, Hart Commons overlooking Hart Lake (Alternate Thursdays June 13-August 22, 2019). Fridays at the Log Cabin, August, Kaleva. Summer Sounds, 7pm, Michigan Legacy Art Park, Thompsonville (July 5-26, 2019). Sounds from the Forest, 7pm, Wenger Pavilion, Baldwin (June 22-August 31, 2019). Summer Sounds, 7pm, Michigan Legacy Art Park, Thompsonville (August 3 & 10, 2019). In addition, several businesses including Gull Landing in Pentwater, offer concerts throughout the summer months.